Size: About the size of a small SUV -- 10 feet long (not including the arm), 9 feet wide and 7 feet tall -- (about 3 meters long (not including the arm), 2.7 meters wide, and 2.2 meters tall), or about the height of a basketball player. 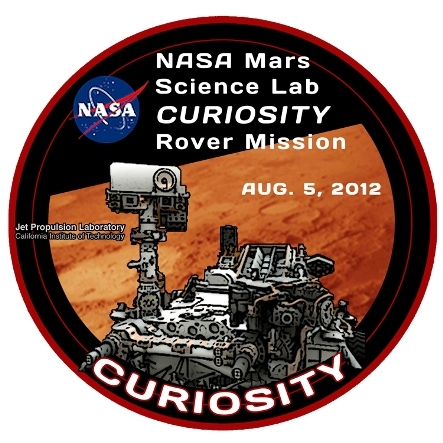 With its rover named Curiosity, Mars Science Laboratory mission is part of NASA's Mars Exploration Program, a long-term effort of robotic exploration of the red planet. 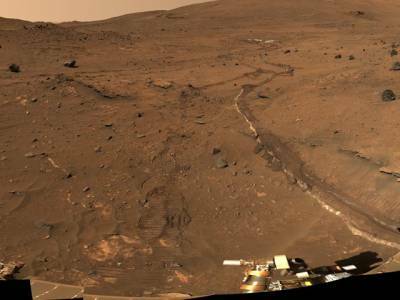 Curiosity was designed to assess whether Mars ever had an environment able to support small life forms called microbes. In other words, its mission is to determine the planet's "habitability. "NASA’s Mars Science Laboratory mission set down a large, mobile laboratory — the rover Curiosity — at Gale Crater, using precision landing technology that makes many of Mars’ most intriguing regions viable destinations for the first time. During the 23 months after landing, Curiosity will analyze dozens of samples drilled from rocks or scooped from the ground as it explores with greater range than any previous Mars rover. 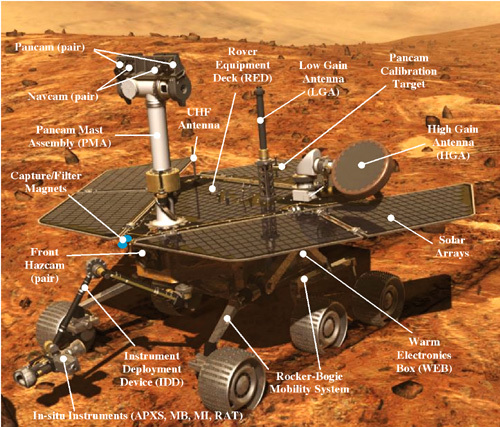 Curiosity carries the most advanced payload of scientific gear ever used on Mars’ surface, a payload more than 10 times as massive as those of earlier Mars rovers. Its assignment: Investigate whether conditions have been favorable for microbial life and for preserving clues in the rocks about possible past life. Mars Science Laboratory/Curiosity National Aeronautics and Space Administration NASA’s Mars Science Laboratory mission set down a large, mobile laboratory — the rover Curiosity — at Gale Crater, using precision landing technology that makes many of Mars’ most intriguing regions viable destinations for the first time. During the 23 months after landing, Curiosity will analyze dozens of samples drilled from rocks or scooped from the ground as it explores with greater range than any previous Mars rover. Curiosity carries the most advanced payload of scientific gear ever used on Mars’ surface, a payload more than 10 times as massive as those of earlier Mars rovers. Its assignment: Investigate whether conditions have been favorable for microbial life and for preserving clues in the rocks about possible past life. The Mars Science Laboratory spacecraft launched from Cape Canaveral Air Force Station, Florida, on Nov. 26, 2011. Mars rover Curiosity landed successfully on the floor of Gale Crater on Aug. 6, 2012, Universal Time (evening of Aug. 5, Pacific Time). Engineers designed the spacecraft to steer itself during descent through Mars’ atmosphere with a series of S-curve maneuvers similar to those used by astronauts piloting NASA space shuttles. During the three minutes before touchdown, the spacecraft slowed its descent with a parachute, then used retrorockets mounted around the rim of an upper stage. In the final seconds, the upper stage acted as a sky crane, lowering the upright rover on a tether to the surface. 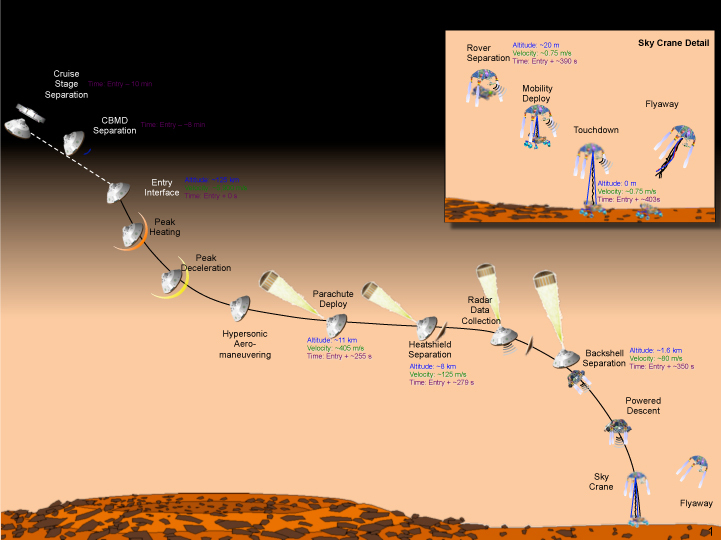 Curiosity is about twice as long (about 3 meters or 10 feet) and five times as heavy as NASA’s twin Mars Exploration Rovers, Spirit and Opportunity, launched in 2003. 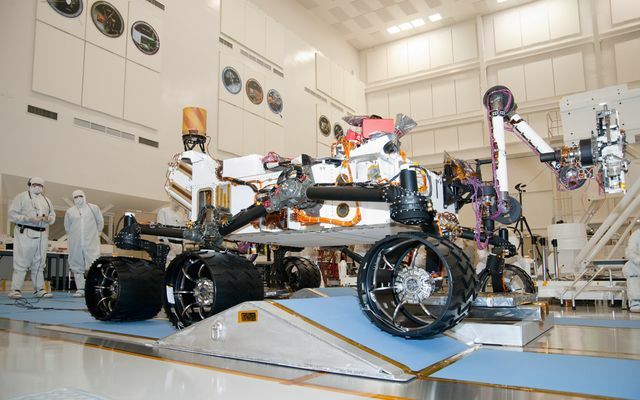 It inherited many design elements from them, including six-wheel drive, a rocker-bogie suspension system and cameras mounted on a mast to help the mission’s team on Earth select exploration targets and driving routes. 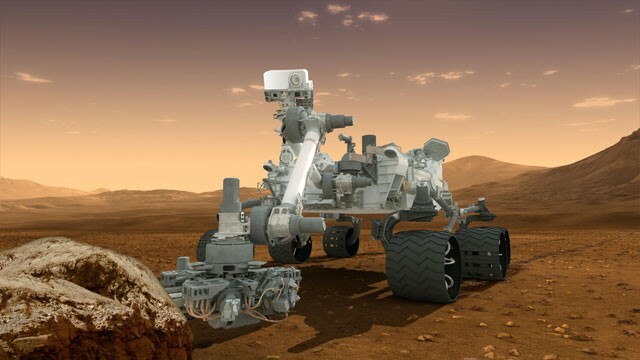 Unlike earlier rovers, Curiosity carries equipment to gather samples of rocks and soil, process them and distribute them to onboard test chambers inside analytical instruments. 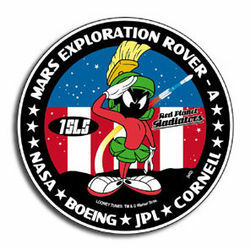 NASA's twin robot geologists, the Mars Exploration Rovers, launched toward Mars on June 10 and July 7, 2003, in search of answers about the history of water on Mars. 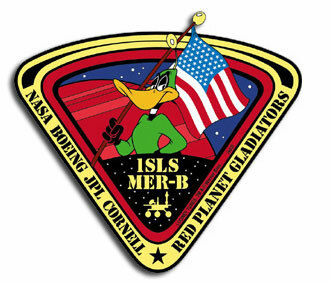 They landed on Mars January 3 and January 24 2004 . The Mars Exploration Rover mission is part of NASA's Mars Exploration Program, a long-term effort of robotic exploration of the red planet.